All are invited to an Open Mic Poetry Night hosted by MAWP students Meredith Boe and Maria Hlohowskyj this Thursday, May 30th, at the Bourgeois Pig Cafe, 738 W Fullerton Ave, Chicago, from 8:00-10:00 p.m. If you are interested in reading, arrive a few minutes early to sign up, and have a short poetry selection prepared. Fiction and nonfiction are also welcome, as long as selections are under five minutes long. For more details, you can join the Facebook event at facebook.com/events/327394267388656. Triumph Books, the country’s leading sports book publisher, seeks an ultra-organized, proactive Acquisitions Coordinator to join its dynamic publishing team in Chicago. This is an entry-level position that supports all aspects of new title acquisitions. Primary responsibilities include maintaining a database of information on recently contracted and under-consideration titles, managing flow of title information between acquisitions and other departments, processing contracts and managing royalty advance payments, responding to unsolicited book proposals, researching sales of competitive titles, and a variety of other administrative tasks. The ideal candidate will be a self-starter with a passion for sports, who is also deadline-oriented and can happily multitask under tight deadlines. Proficiency in Microsoft Word, Excel, and Outlook is a must. Interested candidates should forward their résumés, cover letters, and salary expectations to Linda Matthews at lmatthews@ipgbook.com. No phone calls, please. 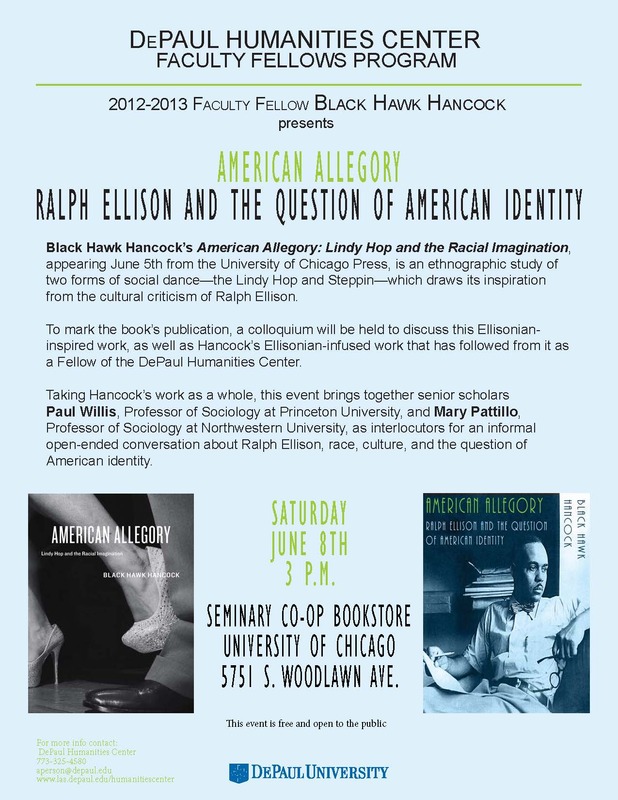 The final DePaul Faculty Fellows Series event of the year will be taking place on Saturday, June 8th, 2013, at 3:00 p.m. at the Seminary Co-op Bookstore, University of Chicago, 5751 S. Woodlawn Ave. All are welcome to attend as Faculty Fellow Black Hawk Hancock presents: American Allegory: Ralph Ellison and the Question of American Identity. “Black Hawk Hancock’s American Allegory: Lindy Hop and the Racial Imagination, forthcoming spring 2013 from the University of Chicago Press, is an ethnographic study of two forms of social dance—the Lindy Hop and Steppin—which draws its inspiration from the cultural criticism of Ralph Ellison. In doing so, it brings to the surface the racial tensions that surround white use of black cultural forms. Focusing on new forms of appropriation in an era of multiculturalism, American Allegory underscores the perpetuation of racial disparities and offers Ellisonian insights into the intersection of race and culture in America. In celebration of the book’s publication, a colloquium will be held to discuss this Ellisonian inspired work, as well as Hancock’s Ellisonian infused work that has followed from it as a Fellow of the DePaul Humanities Center. This later work takes up three central themes of Ellison’s thought: the diverse ways Ellison approached issues of race, culture, music, literature, and politics in relation to American identity; the centrality of the seemingly ordinary, those often unheard and unseen aspects of African-American life, and American life more generally; and the Ellisonian conviction that American Identity is of a whole. Black Hawk Hancock is an associate professor of sociology at DePaul University. His research focuses largely on issues of race and culture. His ethnographic work has appeared in Ethnography, Journal of Contemporary Ethnography, Sociological Perspectives, and Qualitative Sociology. His book American Allegory: Lindy Hop and the Racial Imagination is forthcoming spring 2013 from the University of Chicago Press.